The Russian Olive tree means different things to different people. To the 1900s pioneers it was precious shelter from wind and sun in the eastern plains where nothing else would grow; to a biologist, an invasive species that chokes out native trees and to hunters and fisherman, a bush-like beast with a knarled trunk and nasty two-inch thorns. To Andrew Bishop it is a treasure chest waiting to be opened. Bishop transforms this pesky tree into beautiful furniture. As owner and operator of River Bottom Restoration his mission is two-fold. 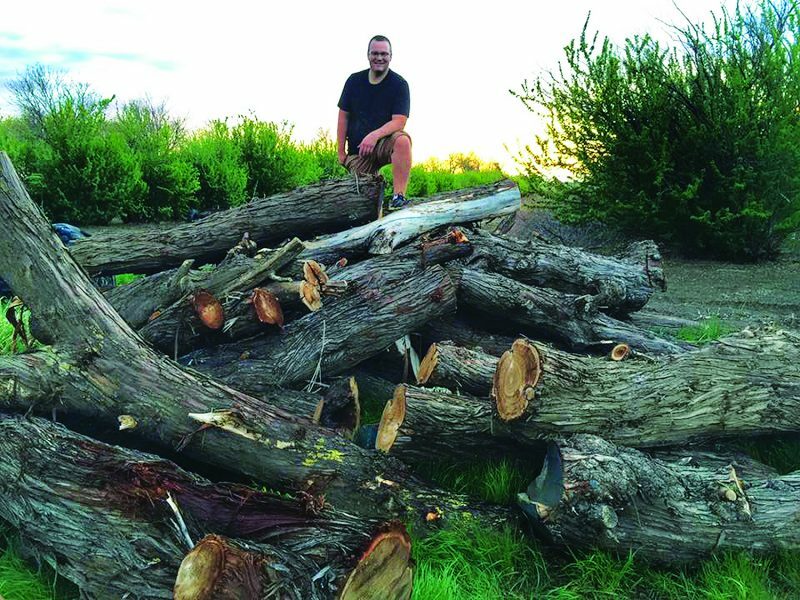 He removes Russian Olive trees that are considered a noxious weed in areas of several states including in Montana and transforms them into gorgeous one-of-a-kind pieces of furniture, décor and pieces of art. It all began when he was fresh out of college – new job, new town and a new apartment without a stick of furniture. He bought a couch and says, “I was too cheap to buy any more furniture.” So he built a couple of blue pine pieces with his dad at their farm near Brady, Montana. Then he harvested a Russian Olive tree on their farm and discovered the stunning beauty of the wood when its rich tones and wild grain were revealed in a table he built. He posted a photo on Facebook and within five minutes he had a request from a Jordan rancher to build a table. Four months later he was shipping tables to Alaska, Phoenix and Ohio as well as throughout Montana. Bishop says, “I knew I was on to something.” He couldn’t find any other furniture makers who specialized in Russian Olive and as a result it wasn’t long before he had orders backed up for a year. Right now his day starts at 5 a.m. so that he can work five hours in the evening after his job as an engineer. He is considering hiring help to meet the demand. His first engineering job was in Billings and more recently in Great Falls where he is happily closer to the family farm, his girlfriend and the barn that he is renovating for his shop. He loves engineering, but he also has a goal to someday run the family farm along with building furniture and establishing a storefront. He also works with artists that envision another use for the beautiful wood pieces that might otherwise be scrap, a collaboration that supports his desire to see the tree used well. 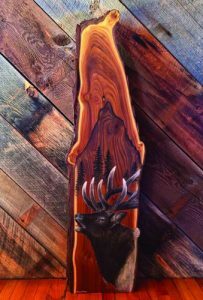 One artist painted elk on a particularly gorgeous grained piece; another used pyrography, a wood-burning technique to integrate trout figures into the striking piece of wood. His father is a wood turner and makes beautiful bowls from the tree burls. Bishop loves the process as well as the results. He is like a kid at Christmas when he harvests the tree, all the while envisioning the different furniture each section will produce. He bought a sawmill because he loves “opening it up” by sawing the tree into slabs that allow the grain to appear. 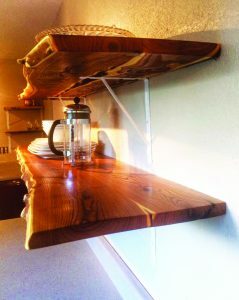 He says Russian Olive is not easy wood to work with because of varying hardness and a tendency to rot and warp. But the challenge is another reason he loves the wood, which he carefully stickers for drying and tenderly sands to a silky finish. He says, “It is very tactile – something you don’t want to stop touching. His passion for his craft is contagious, just as the interest in his unique wood furniture. 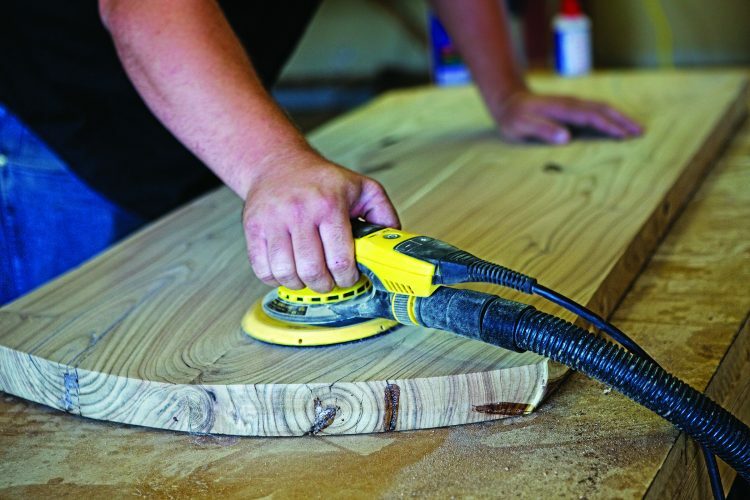 He considers it the perfect formula when he is able to eradicate an unwanted Russian Olive tree grove for someone and then leave them with something lasting and beautiful in the form of a piece of furniture. Because Bishop not only likes to do good work. He likes to do good things. For more information visit www.rbrfmt.com or call 406-868-8561.